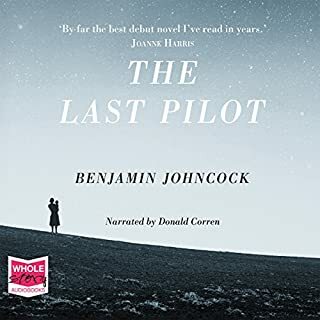 The Last Pilot begins in the bone-dry Mojave Desert during the late 1940s, where US Air Force test pilots are racing to break the sound barrier. Among the exalted few is Jim Harrison: dedicated to his wife, Grace, and their baby daughter. By the 1960s, the space race is underway, and Harrison and his colleagues are offered a place in history as the world’s first astronauts. Jim is faced with the decision of whether to accept his ticket to the moon and at what cost. An enjoyable story, well-narrated. Not what I expected - more about relationships than technical 'spacey' stuff, but enjoyable nonetheless. A good period feel to the story, the overall atmosphere is melancholy and meditative. Recommended. Seventy-year old avant-garde composer Peter Els opens the door one evening to find the police outside. His DIY microbiology lab has come to the attention of Homeland Security. Panicked by the raid on his house, Els flees and turns fugitive, waiting for the evidence to clear him and for the alarm surrounding his activities to blow over. But alarm turns to national hysteria. A sophisticated and enjoyable listen/read! 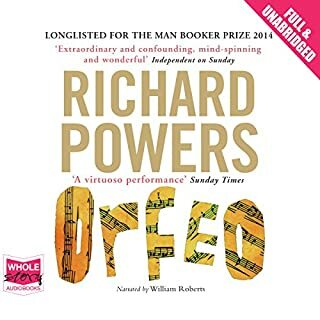 Would you consider the audio edition of Orfeo to be better than the print version? Not necessarily - I enjoyed both, reading on my kindle, then listening on my iPhone while in the car, doing the dishes or gardening! The reading is very good. What does William Roberts bring to the story that you wouldn’t experience if you had only read the book? How to pronounce complex scientific and musical terms! The sound of the reader's voice is very believable as a representation of the narrator. It is a bit long for that, but I certainly always wanted to carry on listening. A really great novel narrated in a thoughtful and appropriate manner. Particularly enjoyable for fans of 'serious' music, science and those with an interest in the absurdities of modern social media, technology, the 'news cycle' and paranoia.